Is man able to do good? It may seem like a simple question but the answer depends on whom you are asking. In mankind's eyes we are doing good naturally and evil is the rare occasion of our "lesser nature." Man always looks better in his own mirror than God's. To those who don't want to look in God's mirror they can dress themselves up quite well that staring themselves in the mirror is enjoyable. Those who look into the mirror of God's standard - His Word do not like to stare too long because it reveals their faults and flaws, and unless they want to change them they don't want to look any further. This group defines humanism as "a progressive philosophy of life that, without theism, affirms our responsibility to lead ethical lives of value to self and humanity." The majority of Americans are not atheist or agnostic; a Pew Forum on Religion and Public Life poll from earlier this year found 92 percent of Americans believe in God. So it is not an adverse reaction for religious people to think the humanists are saying--Have a not so merry Christmas and by the way do good without God. Every Christmas Conservative Christian groups have been making efforts to keep Christ in Christmas because of the nativity scenes being banned and retailers who would use the generic "holiday" greetings and not identify with what the season is supposed to be about (chuckle). Humanist association spokesman Fred Edwords said," Our reason for doing it during the holidays is there are an awful lot of agnostics, atheists and other types of non-theists who feel a little alone during the holidays because of its association with traditional religion." Edwords says the purpose isn't to argue that God doesn't exist or to change minds about a deity, although "we are trying to plant a seed of rational thought and critical thinking and questioning in people's minds." Rational thought and critical thinking went the way of the dinosaur as humanists used a fictional character and his words that does not exist (except for children). That’s what they believe of God, he does not exist-so what's the point. Is it rational to have people believe in a statement from someone that does not exist to promote them think or to promote that one can do good without God? Edwords on the humanism website says: What is humanism? “The sort of answer you will get to that question depends on what sort of humanist you ask! That's an interesting point--So I guess its all a matter or perspective. Like the word GOOD? He then lists all the categories of humanism with their explanations: Literary Humanism- Renaissance Humanism- Cultural Humanism- Philosophical Humanism – Modern Humanism-Secular Humanism- Religious Humanism- Christian Humanism. And states “The most critical irony in dealing with Modern Humanism is the inability of its advocates to agree on whether or not this worldview is religious. Those who see it as philosophy are the Secular Humanists while those who see it as religion are Religious Humanists. This dispute has been going on since the early years of this century when the secular and religious traditions converged and brought Modern Humanism into existence. "How do we define 'GOOD if there is no ultimate standard from God? God’s word, the Bible, expresses to mankind what is good and bad what is right and wrong. Can each of us be left to define what is good? Would not the definition change from each culture, from each society from even each person when we look at the specifics of its application and meaning? When asked further about the purpose he stated he does want a bigger club with like minded people, they can sign up and pay dues. Where's the rational thinking, his position is not the equivalent to saying, I’m not worried about a meteor hitting earth this next week. His answer is not good enough. If we are wrong, and lived a life pleasing to God then we are all the better for it, however, if a humanist is wrong and lived a life against God, doing what they want as their own standard, they will have much to answer for and it will not be pleasant. So why be a humanist and be unsure of everything when you can be sure? Among the humanists there are diverse opinions and categories. Secular humanism is the branch of humanism that rejects religious belief of God and the supernatural from God. Regular Humanism believes in humanities capacity to do good and adheres to human reason, ethics, and justice, which they believe gives meaning to life. I would like to point out that these are all believed to have come from God. “Humanism asserts that knowledge of right and wrong is based on the best understanding of one's individual and joint interests, rather than stemming from a transcendental truth or an arbitrarily local source” (Corliss Lamont, (1997). The Philosophy of Humanism, Eighth Edition. Humanist Press pp.252-253 ). There are two ways to live life and pursue being happy with God or without God. You have done some good and heaped up success for yourself- but one day it will end, bank on it. Luke 12:19-21 'And I will say to my soul, "Soul, you have many goods laid up for many years; take your ease; eat, drink, and be merry."' "But God said to him, 'Fool! This night your soul will be required of you; then whose will those things be which you have provided?' "So is he who lays up treasure for himself, and is not rich toward God." Which standard should we use for good? Should we use our western cultures standard or another? 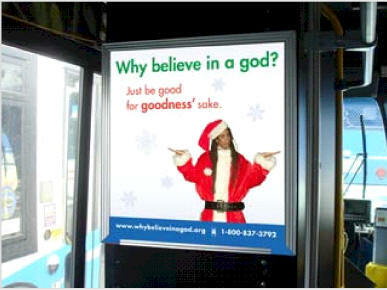 The Santa Claus standard or God’s? If the humanists used the Bibles standard of good (remember they would consider Santa as the same as God- both are untrue) they would find they cannot do the good that God requires. God’s standard of good is to be fair to all, He is just. God’s character, His very being is good and it does not change. Man who is made in His image is sinful but can still do good occasionally but this does not change his nature. Jesus made it clear Matt 15:19: “For out of the heart proceed evil thoughts, murders, adulteries, fornications, thefts, false witness, blasphemies” Can we trust our heart to tell us what is good or evil when God said the heart is deceitfully wicked. The real question becomes- how can one be more good than not, than being evil. Rom. 3:10-12 As it is written: "There is none righteous, no, not one; There is none who understands; there is none who seeks after God. They have all turned aside; they have together become unprofitable; there is none who does good, no, not one." Solomon who was the worlds wisest man during his time period had people came from near and far to speak with him. He understood no matter how good you may think you are, you still do not make the standard of God’s good and have to deal with the sin that you always have with you. Paul was once a very religious man and he came to the conclusion when he saw the savior Jesus Christ that the good he thought he did (even for God) was not. One does not have to be an atheist or an agnostic to be a humanist but one does need to believe in God to understand what good actually is. Without God’s knowledge no one can do good. Jer. 4:22: “For My people are foolish, they have not known Me. They are silly children, and they have no understanding. They are wise to do evil, but to do good they have no knowledge." The best decision one can make is to believe in God- in Jesus Christ, that will have them understand what is good.